In this section we will discuss bisecting a line segment. Bisect means divide the line segment in two equal parts. Draw a line segment measuring 5 cm and its perpendicular bisector. Write the steps of construction. Step 1 : Draw a line segment AB of length 5 cm. Step 2 : Mark two arcs with radius more than half of AB with centers A and B respectively. Step 3 : These arcs intersect at P and Q respectively. Step 4 : Join P and Q. 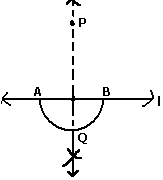 Step 5 : PQ is required perpendicular bisector of line segment AB. Draw any line segment AB . Mark any point P on it. Through P, draw a perpendicular to segment AB with the help of ruler and compasses. Step 1: Given a point P on a line l.
Step 2: With P as center and a convenient radius, construct an arc intersecting the line l at two points A and B. Step 3: With A and B as centers and a radius greater than AP construct two arcs, which cut each other at Q. Thus PQ is perpendicular to l.
Construction of a line perpendicular to a given line and passing through a given point not lying on it by using ruler and compasses. Draw any line segment AB . Take any point P outside it. Through P, draw a perpendicular to segment AB. Step 1: Given a line l and a point P outside it. Step 2: With P as center, draw an arc, which intersects line l at two points A and B. Step 3: Using the same radius and with A and B as centers, construct two arcs that intersect at a point, say Q, on the other side. 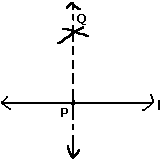 Thus, segment PQ is perpendicular to line l.